Odorous ants are found throughout the United States and are only an occasional pest in the house. Their name comes from the disagreeable odor - similar to the smell of rotten coconuts - that is given off when worker ants are crushed. 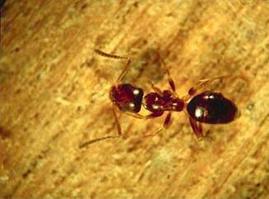 Odorous house ants are small, about 1/8th inch long and dark brown to black in color. They can be taxonomically identified by having a single node on the petiole (connects the abdomen and thorax) that is hidden from above by the abdomen. They have 12 segments and antennae. Workers carry the same characteristics as well as an uneven thorax. Odorous ants usually nest outdoors in the soil under stones, logs, mulch, debris, logs, stumps, under plastic tarps, and other items. If only a few workers‚– the wingless ants - are observed in the house, it is usually an indication that the ants are nesting outdoors and entering the house in search of food. If winged swarmers are found indoors, or if workers are consistently seen in great abundance, it likely that they are nesting within the house. Indoors they are usually located in walls, beneath floors, in floor voids (particularly in moist or warm areas), around hot-water pipes and heaters, behind paneling, and under carpets. Odorous ants are often found foraging for food in long trails over household surfaces, and they mostly invade buildings during rainy weather. Ants entering from outdoors can be discouraged by sealing as many cracks and gaps in exterior walls as possible. When alarmed, the workers will run about in an erratic fashion with their abdomens raised in the air. Although these ants do not bite or sting, they are a persistent nuisance pest once they begin foraging indoors in large numbers especially since they can contaminate food during their foraging. As mentioned, odorous house ants regularly forage for food along well-traveled trails. They feed on dead insects, sweets and meats. One of their favorite foods is the sweet honeydew produced by plant sap feeding insects such as aphids and mealybugs. Like all ants, odorous house ants live in social colonies. These colonies are made up of different groups. Male and female reproductives are often called winged swarmers. Swarmers first appear in the early summer months; the males will emerge from the parent colony first, followed by the new queens. A few days after mating, males usually die and the mated females begin new colonies. When a new colony is initiated, a queen lays a small batch of eggs and tends the larvae that hatch. The adults that develop become workers and take over colony labor activities. Once a colony has been established, queens will continue egg laying one egg per day until late fall. During the winter months adults are inactive and the larvae slow their development. In the spring, workers begin to forage and queens resume their egg laying. Larval development and production increases so the colony can grow substantially during spring and summer. Colonies can be very large, ranging in size from several hundred to over 100,000 individuals. In addition, odorous house ant colonies can produce hundreds of laying queens and thousands of workers. Sometimes these colonies can become so large that they eventually bud. Budding is a process by which the parent colony splits to form satellite colonies. The satellite colonies remain inner-connected to the parent colony by foraging trails. These trails provide for the exchange of workers, food, and larvae.